The announcement followed a decision by the Forestry Commission not to renew the lease, which expires on 12 September. Campaigners including the Green MEP Keith Taylor had been keeping up the pressure on the Forestry organisation not to renew in line with its environmental commitments. “This is fantastic news,” said Lucy Barford on behalf of A Voice for Leith Hill. “Leith Hill has always been a completely inappropriate location for oil drilling, in addition to the overall issue that we should be leaving all fossil fuels in the ground. Local campaigners have been fighting Europa’s plans for a decade and we are overjoyed that the Forestry Commission and the Government minister have finally seen sense and put a stop to the horrendous prospect of oil being drilled in such a beautiful and vulnerable environment. “There will be other battles ahead, oil drilling is still planned for other sites across the Weald, but for now we will be celebrating the fantastic news that there will be no oil drilling at Leith Hill. The Leith Hill Action Group had fought a campaign against the proposals for nearly 10 years, through the planning system and in the courts. 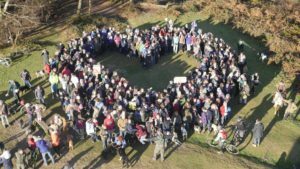 A Voice for Leith Hill had recently harnessed people power to lobby the Forestry Commission about the lease. The Environment Agency granted a permit to drill even though over 100,000 people signed a petition against it. “It’s been a combined effort of so many people – both local and from further away – over such a long time. It really is an extraordinary success,” said Lucy Barford.